The view of Spring from my deck makes me want to bring Spring indoors. Let me be honest here. I put an enormous amount of time and effort into decorating my house for the holidays, but I have never done much to style my home seasonally. 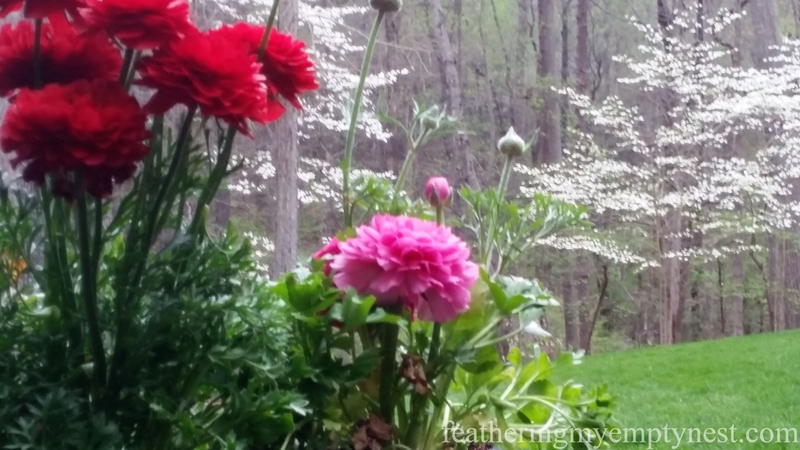 In the spring I tend to pay more attention to my outdoor spaces. I buy plants for my planters, clean the bird poop off my deck, and wage a futile war against the rampaging herds of deer that ravage my yard in pursuit of newly emerging tender leaves. However, since I started this blog, I have been perusing the posts of my fellow bloggers and have come to the painful conclusion that I’m a seasonal decor slacker. Frankly, one of the main reasons I have not given much attention to seasonal decorating is the expense. I know that there are people out there who have a whole different spring and summer wardrobe for their homes. When the days become warmer, they cover their rich velvet sofas with crisp white linen slipcovers and replace plush wool and fur rugs with light cotton or sisal floor coverings. While there is no doubt that this would provide a refreshing change of scenery, it’s just not in the budget for most of us. Nevertheless, not to be left in the dust by my colleagues, I have decided to see if I can step up my spring decor game on the cheap. To this end, I raided my storage cupboards for pots, vases, and vessels of various kinds that could contain greenery. I have always been a fan of decorating with plants, flowers, and candles because they provide a lot of bang for your buck. 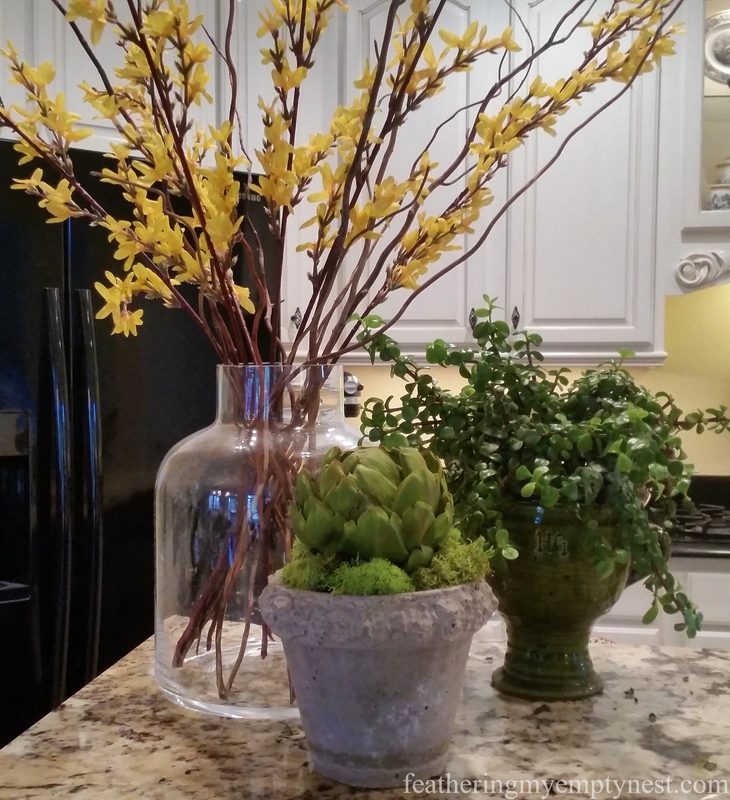 I created a grouping on my breakfast buffet of forsythia branches and curly willow in an old terrarium jar along with a succulent and a faux artichoke in a cement pot. 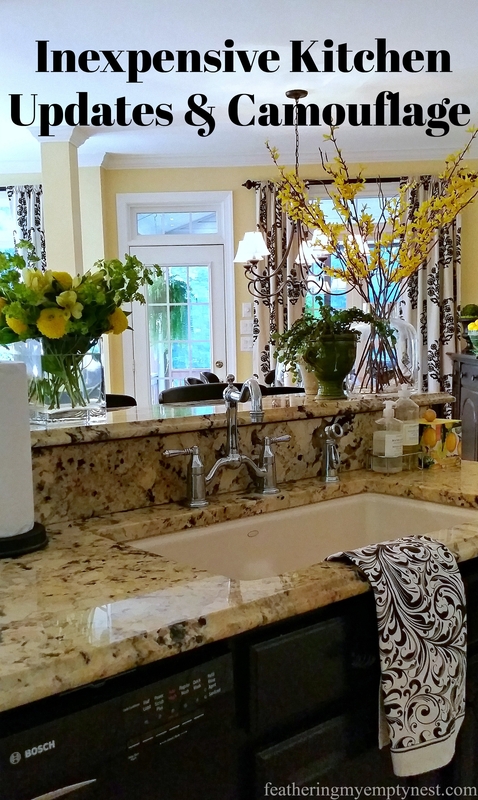 A vase of yellow ranunculus and a pot of jonquils balances out the other side of the breakfast bar. A colorful arrangement of French tulips adds a touch of spring to a black chest of drawers. 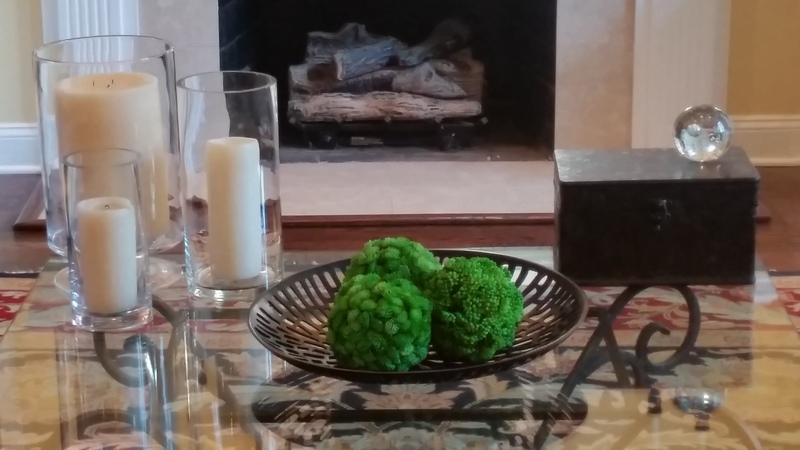 Decorative botanical spheres add a splash of spring green, while glass cylinders filled with white pillar candles offer height and sparkle to the coffee table. 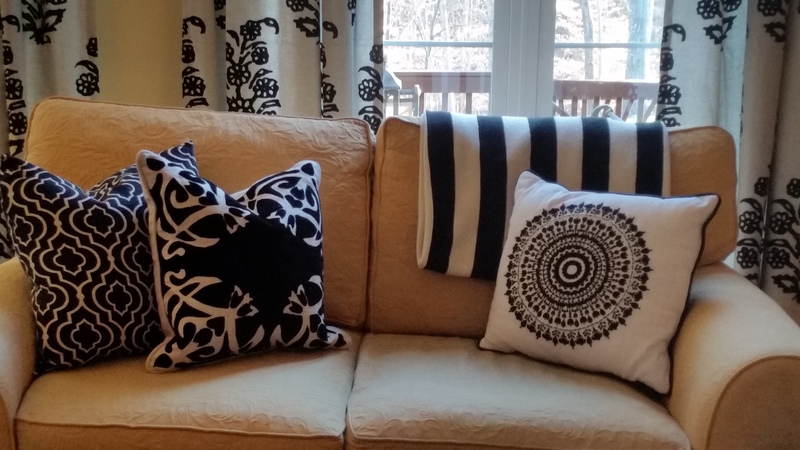 Switching out heavy red throw blankets and richly colored pillows for crisp black and white ones is a quick way to lighten up for Spring. 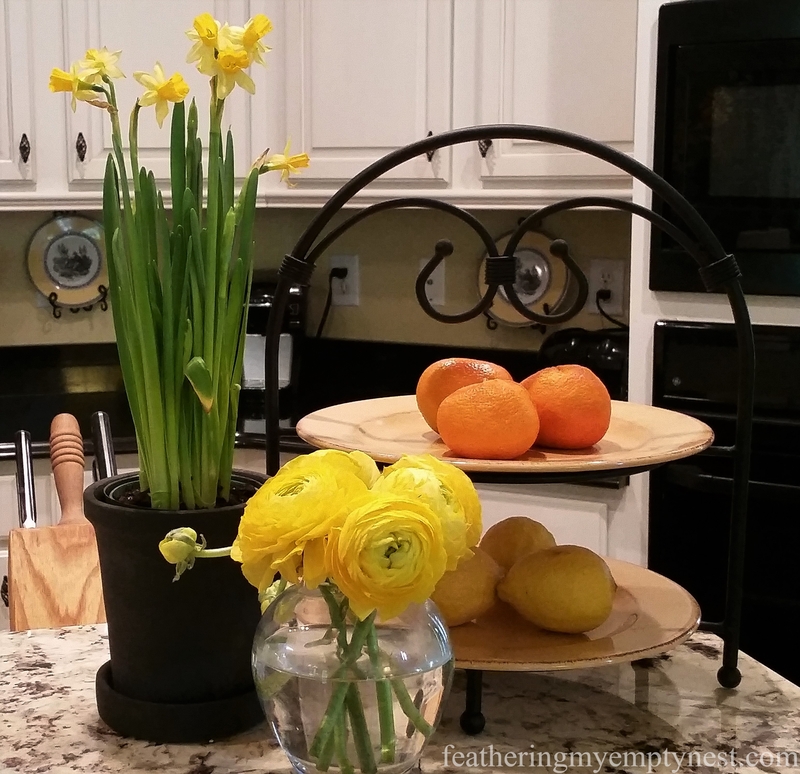 I changed out the accessories that I usually display on and around the buffet in my breakfast area for a lemon-themed dinner party but the arrangement was so fresh and springy, I decided to keep it up for the season. I found this candle called “Sugared Lemon Zest” from Bath and Body Works to add a light, delicious scent to my springtime home. 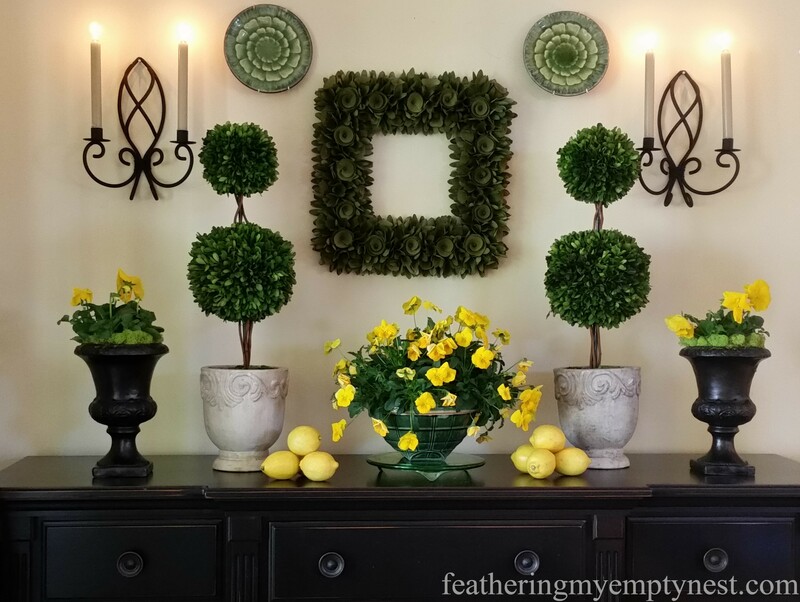 I don’t know if the lighter brighter throw pillows, candles, and flowers I have added to my rooms have transformed my home into a lush springtime bower but I do know that they make me feel refreshed, happier and ready to embrace the challenge of decorating for the seasons to come. your work is always beautiful. But I think i am still stuck on “just” Christmas and Easter “stuff”. I do have my Ukrainian Easter eggs on a spray painted branch in front of me. Thank you so much for your comment on my post. Ukranian eggs are so gorgeous, I would be tempted to display them all the time, not just at Easter. A beautiful home that is full of personality. I love all the pops of black and white that you have throughout your home. They make everything more dramatic and fun! Thank you so much for telling the truth about how most of us live. I do have changes of bedding for warm/cool seasons but changing everything up all of the time just isn’t in the cards for me. I do have a lot of smaller decor but am not up for slipcovers and rugs. It’s too much work. Thanks for taking the time to visit my blog and comment on my post. I am totally a believer that a little goes a long way when it comes to seasonal decorating. Everything looks soooo pretty! I love all of your blossoms. I remember the post about the lemon-themed dining room decor and tablescape. 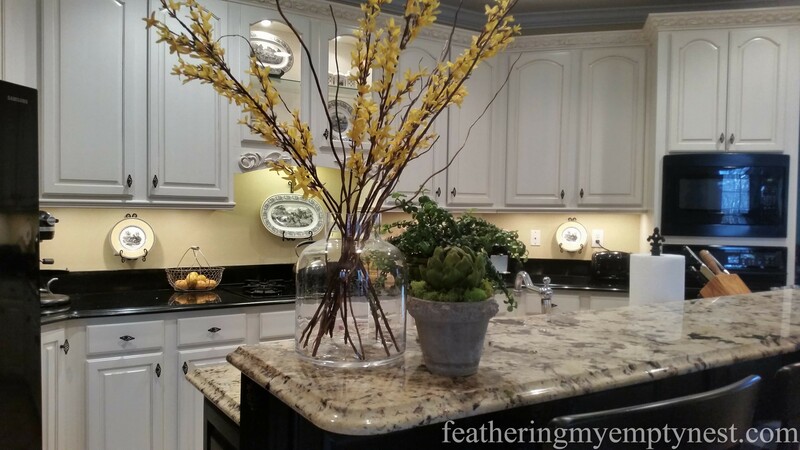 Your dining room looks wonderful with the greenery and the splashes of yellow. very pretty room. love all the black and white. I love the confessions of a decorator! I think that is why I like blogs like yours, I can see ideas for my own home. So don’t get down on yourself too much. I love your spring ideas. I think fresh flowers are so welcoming. Thanks so much for taking the time to visit my blog and comment on my post. I am very envious of your large basement. We have no basement at all, so all my decor items are crammed into every available closet space. Your Spring home is very beautiful. It doesn’t have to cost a lot to add a few touches. The view from your deck is breathtaking. Thank you so much for your kind comment on my post. There does come a time when changing a rooms whole décor is out of line and maybe budget. 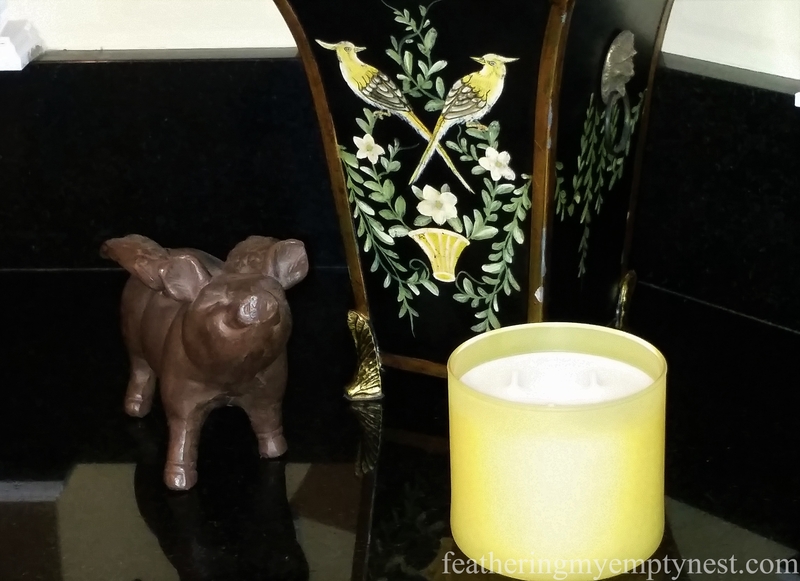 Have gotten so just like to add small decorative elements to brighten up our home. Have too much stuff cluttering up extra bedrooms to change for seasons and it is getting to be more than I want to deal with, time for purging, past time. Recently cleaned out my craft room, took me over 3 weeks. It’s a small room and we’ve done about all we can do to use wall space. Now have to tackle sewing room so can get in there to actually sew, what a concept. That room is even smaller. Changing rugs and putting slip covers on sofa, not happening. I have couple of white cotton blankets gotten at thrift stores I put on couch and chair to bring some spring/summer to l/r, blankets are used all year to keep couch and chair clean with dog/cat in room. Got a very pretty simply embroidered tablecloth from thrift store, put it across back of couch tucked in under back cushions, adds pretty accent and keeps room light. Easy to throw in wash with blankets. Between washes I put blankets and cloth in dryer to refresh, get rid of dog/cat hair. You have right idea, keep life simple, not more complicated and more work/expense. We live in an expensive area for us. Living on just SS isn’t easy and having several 5 week months between paydays sure stretches any budget, ours is screaming at end of 4th. week with another to go. Prices of things here are as though there’s oil in everything. Grand Junction is troubled oil area, off and on too often but prices don’t go down to reflect it. Personally if we’d known how expensive it was here we’d have gone back to MT after KY. Your home is quite wonderful, enjoy it with what you’ve done which is gorgeous. People and family should visit you not to see how you spent money on decorations. I make a lot of seasonal decorations as you did, simply. Thank you so much for taking the time to visit my blog and comment on my post. I am envious that you have both a craft and a sewing room. I would love to have a dedicated space to store supplies and work on my projects. Your idea about using a pretty tablecloth to lighten and brighten your sofa for the warmer season is inspired. I agree with you 100% that you don’t have to spend a lot to create a beautiful home. God bless. Thank you so much for taking the time to visit my blog and comment on my post. 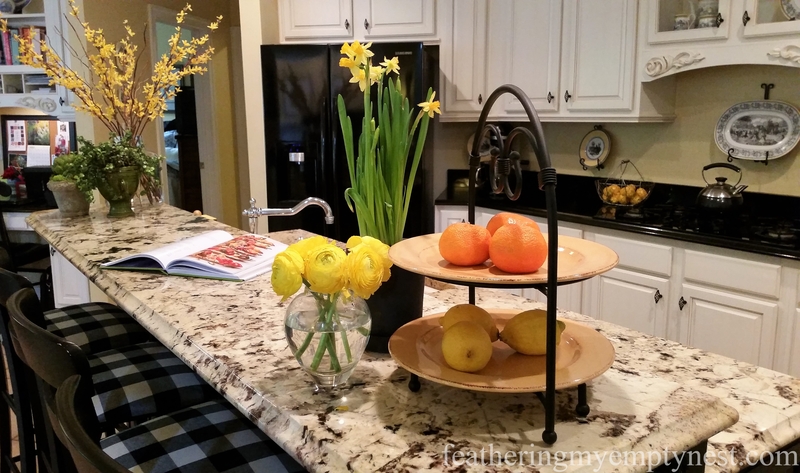 I agree with you that you can make a substantial change with a few fresh additions to your decor. Cheers! Your home is beautiful! I’m horrible and do not usually decorate with the seasons but, things are slowly changing over here 😉 Thanks for sharing with us at Funtastic Friday! Thank you for your kind comment on my post and thank you for hosting a great Funtastic Friday party. It’s all so pretty and does add a Spring touch. I think the greenery, flowers and pillows add a lot. I am not much for decorating seasonally except for a wreath on the front door. I do decorate my front porch but inside it is the same old, same old! 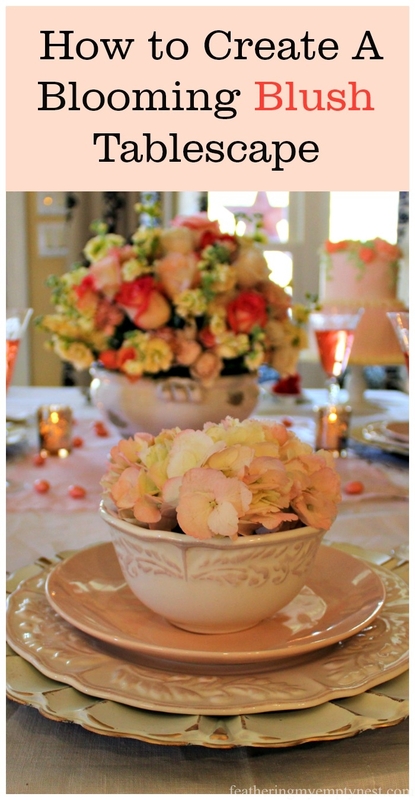 I do have lots of centerpieces and things to change things out but I just don’t bother. Thanks for the inspiration! Thanks so much for taking the time to visit my blog and comment on my post. I think all the colorful touches definitely create a “Spring” feel! As a fellow ‘seasonal slacker’ I admire what you’ve done here. 🙂 Thanks for sharing with Party in Your PJs! Thanks for your kind comment and thanks for hosting. Thank you so much for your kind comments about my post. From the sounds of it, I will really have to step up my seasonal decorating efforts to keep up with you. I hope you continue to bring joy to your family for many years to come. Gorgeous! I’m loving the fabric of your curtains. Thanks so much for your kind comment. 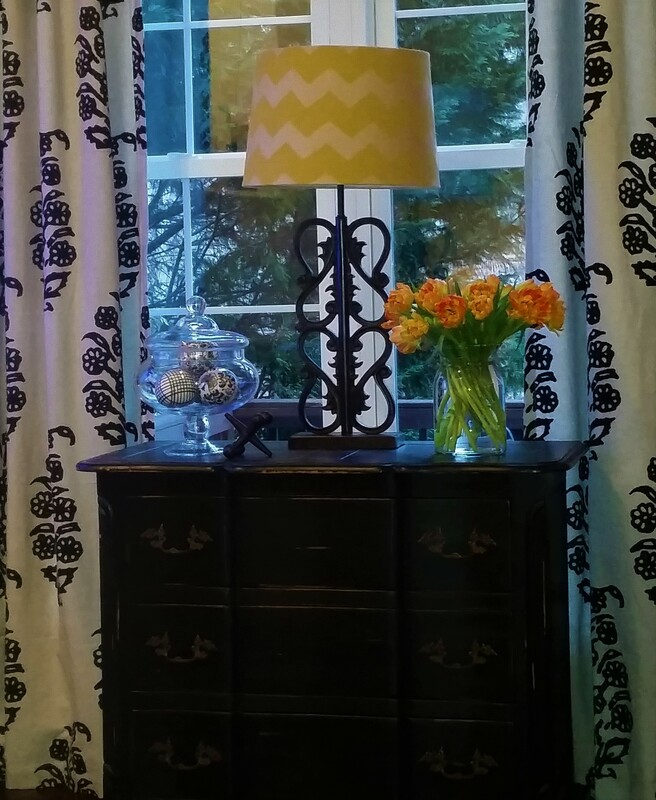 If you are interested, my curtains are ready made wood block print panels from Ballard Designs.